Home Betta Can Other Fish Live with Bettas? So, you set up your new fish tank, and you got a betta, but now your aquarium is looking a bit lonely. Before getting more fish into your tank, you should know that the betta are also known as the Siamese fighting fish, and they are very territorial and aggressive. Male bettas, in particular, will kill other males and many other different species when they see them as threats. Some of the top models we found regarding tanks can accommodate many types of fish, but it is very important to know which breeds can live together well. Where bettas are concerned, two or more females can live together, but aggression will still occur. Having a male and a female in the same tank is not a good idea either, as the male might become violent and attack the female in order to show dominance. Fortunately, there are some species that your betta can tolerate. This article will give you some ideas about the fish you can put together with your betta. Before we begin, it is important to understand that these are only suggestions. 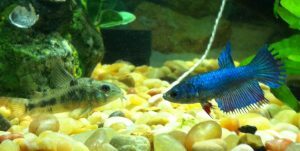 It is possible that your betta could get along very well with other species as well, or it could kill and eat them. Each betta is different, so these are only some general guidelines. Rasboras are the most appropriate tank mates for your betta due to the fact that the two species naturally co-exist in the wild. Their water and feeding requirements are very similar, so putting together both species in the same aquarium should not pose any issues. Still, you ought to keep in mind that this breed is shoaling and prefers living in schools of five or six. They grow to about 1.5 inches and can live up to five years. They love to swim, so you should set up a tank big enough to offer them plenty of room. If you need a fish that would eat snails, but not cause any issues to your betta, you can keep the loach in mind. Once the job is done, and all the snails are gone, loaches can be fed with pellets, and they will enjoy those too. There are multiple types of loaches, and some of them can grow up to be quite large. Still, kuhli loaches, yoyo loaches, or zebra loaches only grow up to 2.5 inches in length. These are schooling fish, so you need to get at least three of them. In most cases, the loaches get along with bettas very well. 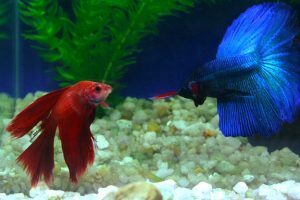 There had been situations when they became aggressive, and in very rare cases, they would attack a betta by eating its fins. If you want to get loaches for your aquarium, you should keep an eye on them, and remove them in case they cause issues. This is a very good option for your betta, and for keeping the bottom of your aquarium clean. Usually, bettas tend to leave the ghost shrimps alone. There have been cases, of course, when the bettas became aggressive and ate the little guys, but these are rare situations. The ghost shrimps do not harass other fish, so there is a good chance they might be able to live together peacefully. For a three-gallon tank, it is recommended to keep eight to ten ghost shrimps. Also, you should get the largest shrimps you can find at the pet store so that they have bigger chances of survival. It is essential to know that shrimps have temperature sensitivity. If the water is too warm, they will turn pink and die. 78 Fahrenheit degrees is near their upper limit. 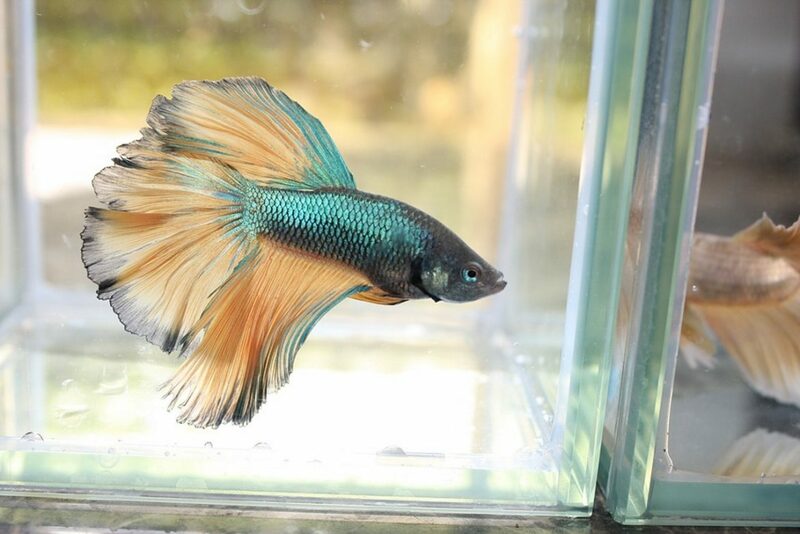 This breed is ideal for betta tanks, at least for a while, until they grow. Within a year, a one-inch pleco you buy from the pet store can grow to 7 inches. Your betta will still get along just fine with it, just make sure you have an aquarium big enough to accommodate them. Other plecos still get along well with bettas, but they grow even larger, some to over a foot long. Besides this growing issue, the Bristlenose plecos and bettas are compatible mates and can live together in an aquarium with no problems. Plecos are shy fish and will avoid your betta as much as possible. They also hide when you get close to the tank. The pleco is not a colorful fish, but it is still interesting enough for your aquarium. It will spend its time attacking debris and extra food from the bottom of the tank. These are beautiful fish and will make your aquarium look even nicer. Neon Tetras have blue and red stripes that seem to glow. Also, the best thing is that they get along with most bettas. Unlike the betta which will spend its time at the top of the tank, tetras are mid-tank fish, so the two of them will not cross each other’s paths and will not have to fight for the same space. The tetra is an omnivore breed and will eat algae and flake foods. This species is a schooling fish, so you need to get a minimum of six, but twelve is the optimum number. Needless to say, if you want to get neon tetras, you will have to get a spacious aquarium, of at least 10 gallons. This is a lovely breed, and it is easy to care for them. They have the same food and water requirements as the betta. Usually, bettas like warm water and the white cloud mountain minnow prefers colder temperatures. 75 Fahrenheit degrees is a proper middle ground for both fish. These are peaceful creatures which will not disturb their swimming mates, and their discoloration will not make your betta feel threatened in any way.